I've been working my way through Luke-Acts for a research project related to the Bible and disabilities. In so doing, I've been struck by the extent to which Luke is concerned with bodies. Time and again, Luke stresses the physical, corporeal nature of human existence, and God's concern for us as embodied beings. 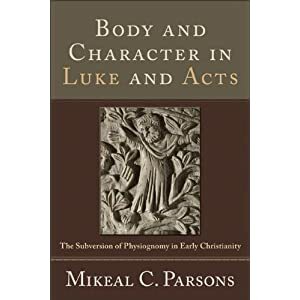 If you'd like a good book on the topic, I recommend Mikeal C. Parsons' Body and Character in Luke and Acts: The Subversion of Physiognomy in Early Christianity. Physiognomy is the practice--which was quite common among the ancients--of linking physical appearance and character. In other words, you could draw conclusions about a person's character by observing his or her appearance. Sound strange? It has a long history, and still carries (normally unacknowledged) currency today. I serve as Academic Dean and Associate Professor of New Testament at United Theological Seminary in Dayton, Ohio. I care deeply about the Church, United Methodism, biblical scholarship, and issues related to people with disabilities. I value public dialogue on important issues, and I think this should be carried out in fair, measured, and intellectually virtuous ways. Your ideas are welcome in comments, but if you want to drop rhetorical napalm please move on to another blog. I'm on Twitter @utsdoc. Via Media Methodists | "Forth from the midst of Babel brought, parties and sects I cast behind…and bow to Jesus' name alone."